Today's entry to this list is my favorite strategy game of the year. Stellaris from Paradox (the creators of Crusader Kings et al) is a massive, complex, sweeping, 4X space strategy game that sees you trying to survive, or conquer, an entire galaxy. I love this type of game, so I was always going to be predisposed to loving this one. This is not an accessible and welcoming game by normal standards. However, it must be said, that by Paradox standards, it actually is the most accessible and welcoming title they have ever produced. The UI is clean and most of the information you need is where you expect it to be. The game does a great job of presenting it's layered swathes of data in an appealing way. What's most important though is that the game has character. The various alien races play their roles very well, and seem to develop pretty distinct personalities. Sure, they tend to fit within established genre stereotypes, but they sell it far better than I can recall in similar games. The actions of the AI are consistent and interesting. Federations and alliances are formed and destroyed, and the other races usually behave in smart ways. In fact they often surprise you in pleasant ways with how well they can get in sync with your actions, whether it is supporting you, or opposing you. This allows for for the generation of interesting stories. This is always the key element of a good 4X game for me. Does the game create interesting scenarios? 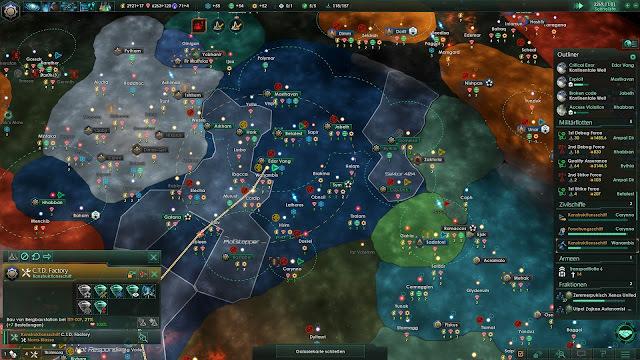 Stellaris does this in spades. 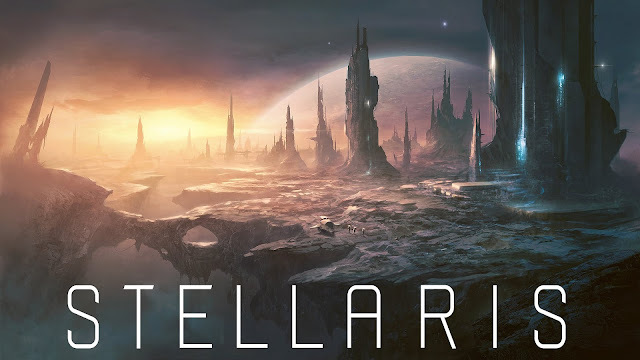 Whether it is you observing evolving new races that pop up in your territory, dealing with alien migration, brokering deals, or dealing with internal rebellions, the game always uses them to ask interesting questions. It allows the game to craft an interesting narrative for you. It even filters down to through the mechanics. The tech tree is interesting in that rather than a traditional tree you can navigate with a master plan, you get presented with new, partly random, research opportunities whenever one is completed. This might seem odd, but it adds a strangely compelling element to the research side of the game, that feels different from other games. The meaningful choices happen more often, because you do not have the ability to plan ten moves ahead and seek out a powerful late game tech. It might occasionally leave you without something you want, but it still manages to create interesting paths. The game also throws some good curve-balls into the mix that add some excitement to what might have been a sprawling slow end-game. I won't spoil them here, but suffice to say, any potential status quo is challenged in interesting ways. It is a slow and thoughtful game, but if it is your kind of thing, it's probably as good an execution of slow and thoughtful as you could hope for!